The purpose of root canal therapy is to retain teeth that would otherwise have to be extracted. The word "endodontic" comes from the Greek "endo" meaning inside and "odont" meaning tooth. The actual procedure involves removing infected or damaged tissue from inside a tooth, and cleaning, filling and sealing the remaining space. After treatment, the tooth is still alive, gaining nourishment from the adjacent tissues of the gums and jaw. Your treated tooth can last a lifetime. An examination, including X-rays, will be performed. Photographs of your teeth may also be taken. A local anesthetic will be given. You will be provided protective eyewear, and a sheet of latex will be placed around the tooth to isolate it and keep it clean and dry during treatment. Treatment consists of the following basic steps, but the number of visits you make to our office will depend on your particular case. Step 1: An opening is made in the crown of the tooth. 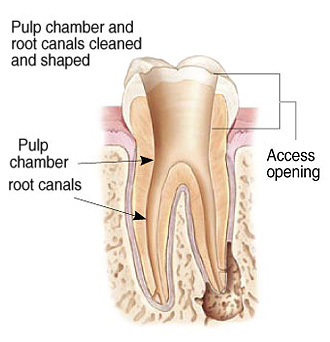 Step 2: The pulp is removed from the pulp chamber and root canals. Tiny instruments are used to clean the root canals and to shape them to a form that will be easy to fill. Medication may be placed in the canals and an antibiotic may be prescribed if the tooth is infected. A temporary filling may be placed in the opening to protect the tooth between visits. Sometimes if an infection is still present, your tooth may be left open to drain and the filling will be placed at a later date. 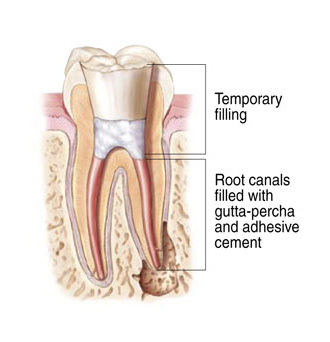 Step 3: When completely clean and free of infection, the root canals are filled and sealed with a material that prevents bacteria from reentering. The opening in the crown of the tooth is sealed with a temporary filling. After treatment, X-rays are usually taken. Step 4: The temporary filling will be replaced by your regular dentist with a permanent filling or some other protective covering such as a crown. With modern techniques and anesthetics, most patients find that having a root canal is as unremarkable as having a cavity filled. Should you experience any discomfort, signal Dr. Wilson and he will do everything possible to make you comfortable. After treatment, over-the-counter analgesics should alleviate any discomfort you may feel. If you experience severe or prolonged discomfort, please call our office. This specialized treatment is what Dr. Wilson does all day, every day. He will take great care of you! 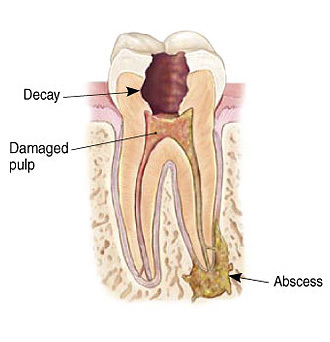 Although the pulp is removed, your tooth remains alive, nourished by surrounding tissues. With regular brushing and flossing, proper diet and periodic dental checkups, your tooth may last a lifetime. What happens after endodontic therapy is completed? Dr. Wilson will ask you to return to your general dentist for final restoration of the tooth because our practice is limited to pulp-related procedures. Your dentist will continue to oversee your general dental care, including regular checkups and cleaning. In some cases Dr. Wilson will want to recheck your tooth at no additional charge. You will receive a postcard to call our office for an appointment. Traditional endodontic therapy is all that is needed in the majority of cases, but some patients will require additional endodontic surgery. Dr. Wilson will determine the best course of action for your tooth during your consultation.